National Song of India Vande matram, Vande matram written by Bankimchandra Chatterji. The song Vande Mataram, composed in Sanskrit by Bankimchandra Chatterji, was a source of inspiration to thi people in their struggle for freedom. It has an equal status with Jana-gana-mana. The first political occasion when it was sung lhras the 1896 session of the Indian National Congress. 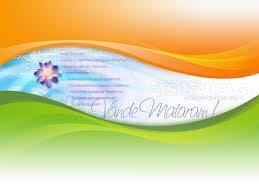 So Dear friiends remember our Mother India and Our National song Which is one of the Best Song Ever!